Welcome to Newforge House, winner of numerous awards and proud member of Ireland's Blue Book and Historic Hotels of Europe. Our Georgian Country House, built c. 1785, has been handed down for six generations. We undertook two years of extensive renovations before opening Newforge House to guests in May 2005. Our six individually designed bedrooms offer luxurious en-suite accommodation. Original features like fireplaces and elegant plasterwork have been retained and restored, whilst excellent king-size and super king-size beds and elegant modern bathrooms have been added to ensure that our guests enjoy a most relaxing stay. Each bedroom is equipped with: wireless broadband access, separate fax and telephone lines, TV and DVD, alarm clock, tea and coffee making facilities, shoe cleaning kit and a hairdryer. Luxury White Company body products and fluffy towels complete our sumptuous bathrooms. Ironing facilities are available on request. A selection of books and DVDs are available for guests to use freely during their stay. We are passionate about providing the freshest and tastiest food, taking particular care in sourcing the best local produce. We aim to reflect the changing seasons in our dinner menus and use free range eggs and meats and organic dairy products where possible. "The Food is out of this world!" Breakfast and dinner are served in our elegant dining room. We encourage our guests to enjoy a leisurely breakfast, but also cater for busy people who need to make a quick getaway. Our breakfast menu offers a selection of hot dishes, which John makes to order, including the traditional Ulster Fry. Whilst the breakfast bar offers a selection of cold dishes including fresh homemade fruit salad. A three-course seasonal dinner with coffee or tea and homemade chocolates is available to guests Tuesday – Saturday, served at 8pm, at £38.00 per person. Residents are welcome to invite their own guests to join them for an evening meal, subject to availability. 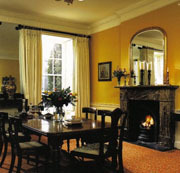 In winter guests can enjoy their meal in front of a roaring fire. Light meal options of homemade soup, sandwiches, salads and dessert of the day are available on Sunday and Monday evenings.